If you are a long time computer user like me, you might have noticed the occasional hurts and discomforts that go hand in hand with spending long periods of time in front of the PC. Stare at a monitor for hours on end, year after year and most likely you'll eventually start to notice the pains magnify in frequency and severity. Do this long enough, and the discomfort could become part of the daily routine when you sit down to work or game at a computer. This is especially noticeable when using a computer setup outside your home or office, where the mouse and keyboard, monitor and even the position you are sitting in are different. If you depend on your computer to make a living, these symptoms can present a major barrier to your ability to work effectively, and not just day-to-day. Poor ergonomics in your computer environment can lead to permanent personal injury. 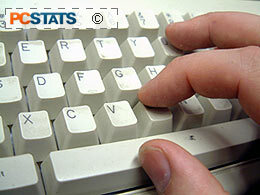 Computer Repetitive Strain Injuries (RSIs), including conditions like Carpal Tunnel Syndrome and Tendinitis, are the most common occupational injuries in North America. Many of these cases would be easily preventable, but still occur due to ignorance of the symptoms or the severity of the injury. Ironically, repetitive strain injuries have been documented as far back as 1793. This guide aims to provide a guideline for identifying and avoiding situations which could result in the development of a repetitive strain injury, and to recommend ergonomically sound computer setups and products. And please, if your livelihood does not depend on computer work and you are reading this anyway, chances are that you are a gamer. Don't pass this article up, unless you can be sure you are not going to be spending 8 hours straight or more in front of your computer when Half-Life 2 comes out… RSIs happen to gamers too, believe me, and a little prevention goes a long way to keeping you in the game. Pun, intended. Repetitive strain injury is a blanket term for several conditions. All involve damage done to one or more of the muscles, bones, nerves or soft tissue due to constant, recurring motions. This also referred to as Cumulative Tissue Damage or CTD. Repetitive strain injuries are by no means unique to computer users, though this is what we will focus on. Like any injury, they are generally easier to prevent than to treat once they have become entrenched. Repetitive strain injuries can result in permanent nerve damage and disability. RSIs caused by computer use are generally in the hands, wrists, neck and shoulders, and include the infamous carpal tunnel syndrome, a compression and irritation of the median nerve responsible for sensation in the thumb, index and middle fingers.